Defence Turkey: Dear Mr. Engin Aykol, first of all we would like to thank you for your time. You have been the General Manager at Nurol Makina for almost 5 years now and it seems that you’ve been making your mark with your staff throughout this period. Nurol Makina has become a prominent brand both locally and worldwide with its products and high-tech technology. We observe the signs of work produced by a team with a systematic point of view and which has identified its direction well. What type of changes have unfolded at Nurol Makina throughout this five-year period? In 2012, at the beginning of my assignment, our product range was considerably different under existing circumstances. We noticed that we had to alter our product range to keep up with the times and also to stay up-to-date within the current conditions of Turkey in order to become a more competitive player in the defense industry market. Our TOMA production has been ongoing but today we manufacture the 4x4 Ejder TOMA which is a unique platform developed over our own chassis, standing out with its high-level terrain capability and ballistic protection. As Nurol Makina, we used to have an organizational structure that adopted the production of a single vehicle yet today we are capable of managing the concurrent operation of five various products. I can claim that the sales we achieved are concrete indicators of our achievement and improvement. Surely, we are still not at the level we aspire to attain but we are striding out to become a crucial player on the global scale. I can sum up our mission as: catering to the requirements of our military and security forces, providing high added value to our Defense Industry, training qualified staff and thus contributing to future generations. Defence Turkey: Taking into consideration your sales figures at home and abroad within this five-year period between 2012 and 2017, how do you assess your growth curve? Can we discuss a robust and sustainable structure in which balanced sales can be achieved at home and abroad? At the onset of my assignment at Nurol Makina in 2012, we set aggressive and long-term goals. Nurol Makina has accomplished essential accretion within this period so that today’s sales figures are ten times bigger than the sales figures from 2012. I would like to state that attained business volume is sustainable and will be ascending. I can candidly clarify that we have already reached the projected ambitious figures for the 2020 vision. Without doubt, this does not mean that we would be reducing our aims. Nurol Makina enlarged its assembly line by two-fold and procured cutting-edge technology devices and equipment which are in limited availability in Turkey. Ejder Yalçın Tactical Wheeled Armored Vehicle has great potential and we will enhance the manufacturing capacity of this vehicle in the upcoming period. We will find out the responses to all these topics in time but we are already conducting the preliminary steps in coordination with our Executive Board. Defence Turkey: What is Nurol Makina’s annual budgeted target for 2017 considering sales at home and abroad? In addition, what are your expectations for the year 2018 when you analyze the conjuncture of the world? Ejder Yalçın Tactical Wheeled Armored Vehicle entered foreign markets for the first time through this period and we accomplished the first export sales of these vehicles. The deliveries of the vehicles started to our export customer and also we keep the deliveries to the Turkish Security General Directorate and Turkish Armed Forces. We are putting forth our utmost effort to participate in numerous tenders launched at home and abroad. In light of the recent developments, our serial production line will be fully loaded in 2018. Surely the aforementioned high production rate does not apply only to our Ejder Yalçın vehicle. I would like to underline that first exports of “Ilgaz-II” and Ejder TOMA vehicles’ were also realized in 2017. We envision that our Ilgaz-II, Ejder TOMA, Ejder Kunter vehicles as well as NMS 4x4 vehicle that was unveiled during the IDEF’17 Fair will be sold in high volumes in the forthcoming period. Defence Turkey: The Ejder Family has become a crucial platform used by Turkish Security Forces with various configurations. Could you please share more with us on the R&D and design activities as well the gathering of a devoted team that was conducted within the scope of the development process of the Ejder Yalçın vehicles which have proved themselves at the theatre? Ejder TOMA and Ejder Kunter vehicles have the same chassis. Ejder Kunter was designed as a Multi-Purpose platform both for personnel and for carrying other payloads. We displayed the Armored Personnel Carrier configuration of this platform at IDEF 2017. Within the context of this APC configuration, Nurol Makina teamed up with the Aselsan and BITES companies on the integration of a “multi-copter” over the vehicle to enable reconnaissance and surveillance capabilities at border and urbanized terrain operations. We displayed the Ambulance configuration of this vehicle at the multi-national Efes 2016 drill. We are open to all manners of cooperation with potential and eager technology companies. Revealing more utility platforms is merely a matter of our efforts. As for the development of Ejder Yalçın, the feedback provided by Turkish Security General Directorate was as essential as the R&D studies. This precious information paved the way toward how the vehicle could perform more effectively in the theatre. Defence Turkey: The Family of Ejder Yalçın initiated development in 2012 and turned into various configurations and was revealed in various configurations, as Ejder Yalçın I-II-III. Currently, which security forces have these derivative Ejder Yalçın Armored Vehicles Configurations in their inventories? Could you please inform us about who has ordered which vehicles and also by which security forces up to date? Ejder Yalçın vehicles remains in the inventory of the Police Special Operations Department, the Turkish Armed Forces as well as the Gendarmerie General Command. The vehicles we have delivered up to date have proven themselves against mines, improvised explosive devices and ballistic threats thanks to survivability and outstanding terrain capabilities. Ejder Yalçın can be designed in numerous configurations thanks to its high payload carrying capacity. We endeavored to exhibit a similar instance of this at the IDEF Fair. We displayed three different configurations throughout the fair; Pedestal Mounted “Cirit” Launcher of Roketsan, Improvised Explosive Devices detection /destruction system and the “jammer” system mounted on these vehicles. Due to the high payload capacity of Ejder Yalçın, these vehicles can be easily outfitted with diversified high-tech systems required by Turkish Security Forces. Defence Turkey: Nurol Makina received a record order of 180 vehicles for the 7.62mm SARP Weapon Turret integrated Ejder Yalçın-III from the Turkish Security General Directorate in the last period. Could you please inform us about the delivery schedule of these vehicles as well as the user who will gain superior capabilities with these vehicles? Aselsan’s 7.62mm Stabilized Advanced Remote Weapon Platform and Ejder Yalçın Armored Vehicles has shown great interoperability in the field. Consequently, this configuration was used for the purpose of integration over the total 180-vehicles bound by contract from the Turkish Security General Directorate. 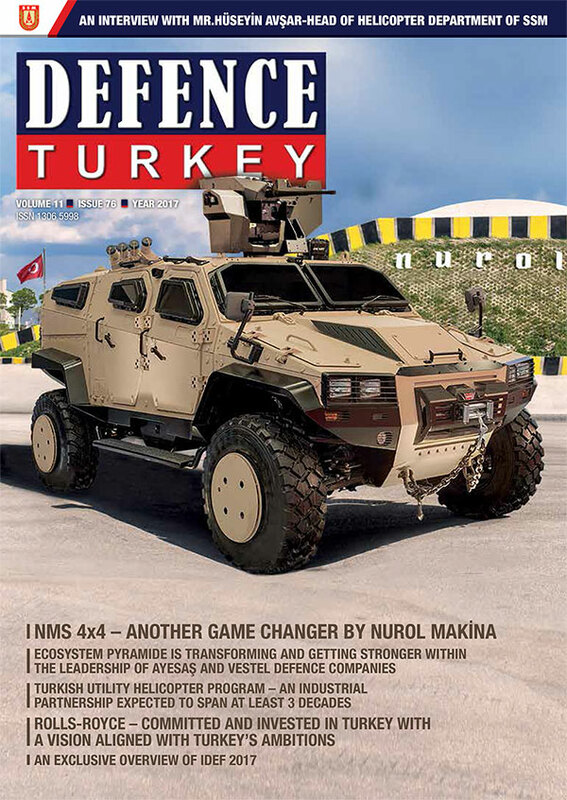 Nurol Makina has accomplished entire deliveries and received additional orders by the Turkish Security General Directorate. We are proceeding with the manufacturing of these additional vehicles. Defence Turkey: The Ejder Yalçın Armored Vehicle is a highly desired platform for security forces and this fact is already apparent with the number of orders placed. You have various rivals at home and abroad. Could you please enlighten us on the details that are making you stand out against the competiton? As Nurol Makina, we are aware of Turkish End User’s requirements. When we design these vehicles, we considered that the greatest deficiency in our country was a vehicle with high protection and this was our starting point. Nurol Makina’s engineers exerted exhaustive efforts to this end. We revealed the first prototype of the vehicle towards the end of 2012 and launched the vehicle at IDEF 2013. Soon after the launch ceremony we initiated the challenging test campaign under various peripheral and weather conditions and the vehicle accomplished whole test process with high success. As a result of the test campaign, Nurol Makina continued its product development activities and manufactured the first configuration of our vehicle in 2014. We received the first order from the Special Forces Department of the National Police to which we now deliver hundreds of these vehicles. With the help of its high protection level against mines, Ejder Yalçın offers unmatched superior mobility to its users under all manners of terrain and weather conditions. Defence Turkey: Mr. Aykol, Nurol Makina signed the first export contract regarding Ejder Yalçın 4x4 Tactical Wheeled Armored Vehicle in March 2017 with the Defense Ministry of Tunisia. Could you please briefly elaborate more about this contract? After a tough business development process, we were able to accomplish the first export sale of our Ejder Yalçın vehicle to Tunisia. We initially had to make an extensive introduction of Nurol Makina and Ejder Yalçın vehicle to the decision makers of Tunisia. Following this explanatory activity, our vehicle had to attend a rough test campaign on the various routes and conditions set by the Tunisian officials. The Ejder Yalçın was one of the last three vehicles that is accepted to the desert tests. Nurol Makina attended the test campaign that lasted for a couple of weeks with a highly qualified team and Ejder Yalçın was the sole vehicle able to fulfil the criteria of the Tunisian Land Forces Command in the consequence of the desert test. I would like to convey my gratitude to all our employees that contributed to these tests via your magazine. We accomplished the deliveries of the first lot of our vehicles and we will continue to deliver the remaining lot in the upcoming months. Defence Turkey: Nurol Makina signed cooperation agreements in various fields with crucial local engineering companies such as FİGES, BITES, NANOBIZ, ATEL at IDEF 2017. Moreover, Nurol Makina reinforced its vehicles with the new generation SARP Weapon Systems. If we evaluate these prominent collaborations established during the fair within an integrated approach, which acquisitions will these contracts provide to you on the path toward excelling and indigenousness? We are a company aiming to supply armored vehicles with the highest level of performance in their class for our armed forces and security forces. To this end, we team up with various technology companies of various scales in order to enhance the efficiency of our platforms. Revealing successful and unique products that effectively fulfil the requirements of the end user could be achieved only through the establishment of such robust eco-systems that allow the gathering expertise within these companies that are positioned at different levels of the supply chain. As a matter of fact, we are accomplishing fruitful projects with the aforementioned companies and other companies within this context. Defence Turkey: You unveiled the NMS 4x4 vehicle launched as the New Generation Light Armored Vehicle at the IDEF 2017. Which requirements were envisaged when designing this vehicle? What are your market expectations for this vehicle at home and abroad? The New Generation Light Armored NMS 4x4 is designed indigenously by Nurol Makina and it stands out with its V-shaped monocoque body and an unmatched military chassis. The lower weight of the vehicle, its outstanding protection against mines and ballistics offer its users high survivability even against aggressive and asymmetric threats and this makes the vehicle superior in the course of operations. The quite low turning radius of the modular NMS 4X4 promises its users great advantages through urbanized terrain operations. NMS 4x4 is designed and equipped with readiness to multi-role capabilities and also features a series of capacities ranging from the transportation of weapon systems in combatant units to reconnaissance and surveillance tasks. Through the New Generation Light Class Armored Vehicle NMS 4x4, we are working on solutions for the diversified protection and security requirements of the Turkish Armed Forces and National Police as well. Defence Turkey: Fulfilling a critical demand for the Turkish Armed Forces and National Police, what kind of capabilities will the Ejder “Kunter” Armored Vehicle bring to our military and security forces. What type of operational requirements are under consideration. Could you please inform our readers about the demands and requirements that you have received within this context? In addition to the local market, there is also a request for these multi-purpose platforms abroad. The Ejder Kunter features a chassis designed specially by our engineers. It has 4x4, 6x4, 6x6 long and short chassis options. The chassis could be customized in accordance with the traction level demanded depending on the task to be performed. Our 4x4 vehicle offers a payload carrying capacity up to 7 tons, and 6x4 and 6x6 versions offer payload carrying capacities up to 14 tons. The feasible traction and carrying capacities provide a versatile capability to the vehicle. The vehicle can be customized according to various task requirements such as Logistic Transportation, Tanker, Weapons Carrier Truck, Command Control Vehicle, CBRN Vehicle, Internal Security Vehicle, Personnel Carrier Vehicle, Patrol Wagon, Armored Money Transfer Truck, Ambulance and Scout Vehicle. Defence Turkey: Another platform as effective as your Ejder Yalçın vehicles is the Ilgaz-II 4x4. This platform is requested both by local and overseas markets. What kind of flexibilities does Ilgaz-II Armored Vehicles provide the users? I have to point out that the Ilgaz-II vehicle is quite different than its previous configuration. We have accomplished the first export sale of the Ilgaz-II vehicle, which was modified according to the customer requirements, to an East African country. Regaining public order by military units and security forces, rapid reaction, responding to illegal demonstrations and Anti-Riot activities are among the tasks that the Ilgaz-II vehicles will be utilized for. Ilgaz-II offers highest operational efficiency in all types of terrain, as a light armored vehicle. Ilgaz-II can be designed and manufactured as an Ambulance, Anti-Tank Vehicle, Combat Vehicle, Command and Control Vehicle, Reconnaissance and Surveillance Vehicle, Anti-Terrorism Vehicle, Internal Security Vehicle and Crime Scene Investigation Vehicle. 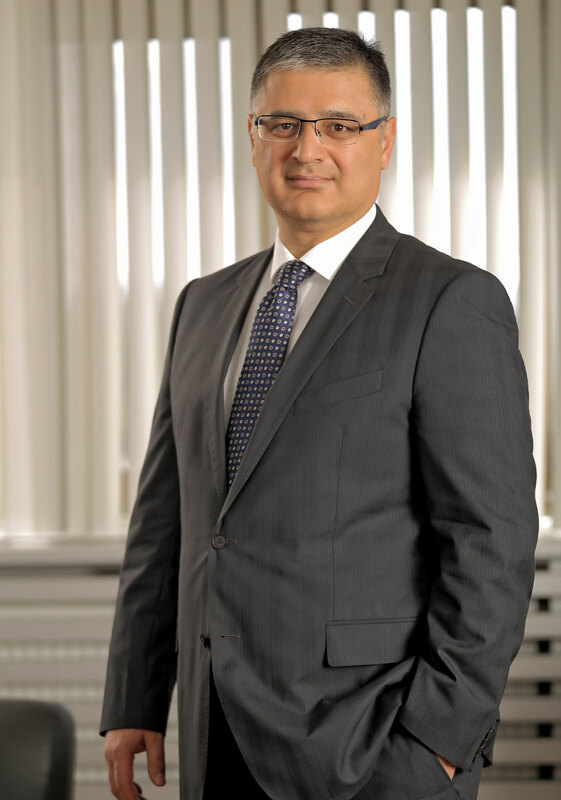 Defence Turkey: Mr. Aykol, what type of growth do you envision for the next five-year period when you take into consideration the sales figures of the last five years regarding sales at home and abroad? As I mentioned previously we achieved crucial growth in the last five years. Our sales figures reached up to $100 million annually. I would like to underline that this growth that we’ve experienced is a sustainable one and we will exceed $100 million. Within the next five years, we will be receiving additional new orders for the existing vehicles and also orders from new vehicles from both local and foreign markets. Moreover, we will be extending our operations by broadening our product range with the inclusion of our new vehicles which will be pioneers within their own classes. I would like to note that foreign sales will be significant in this growth. Defence Turkey: Dear Mr. Aykol, it appears that your sister affiliate FNSS and our major companies such as Aselsan have established joint venture companies with the local foreign companies they conducted sales in, as a result of the major collaborations they achieved over time. Is Nurol Makina conducting joint activities in order to establish similar structures in the countries with which you have close contacts? Have you made any proposals to this end? And regarding this, which type of a model do you offer to these countries within this context? Our foreign sales will be an essential part of our growth. We require permanent structures in the aforementioned countries in order to promote sustainable growth in these markets and actually we have certain studies to this end. The affiliates of Nurol Holding and FNSS in the international arena compose a prominent reference for us as well. Defence Turkey: Nurol Makina have decided to extend its mass production lines in order to comprising the local and foreign market requests its receive and initiated working on the construction of the new assembly line. How are the construction activities proceeding to this end? With the activation of this facility, which type of an increase will there be in the production, integration and the installation capabilities? Will the different configuration demands of both local and foreign customers be simultaneously accomodated? Could you please inform us on the details? The construction of the new assembly line was completed last year and it was launched into operation. The capacity of the assembly line was doubled. Additionally, a new paint shop facility was established within this line. These decisions were realized by taking the current and future orders into account. We currently understand how accurate the decisions were that we made. If we had not made the decision on this investment, it would have not been quite easy to cater to the requests coming in. We have completed the deliveries to Police Special Forces. The production of the vehicles for Tunisia and the Turkish Armed Forces continues and the deliveries are being accomplished in lots. We are capable of fulfilling all request through our existing infrastructure and production capacity. We went through certain improvements in our functioning in order to efficiently fulfil the various configuration request of both our local and foreign enriched customer portfolio. We made significant investments in human resources, processes as well as the relevant software to this end. At this point, we are capable of effectively conducting multi program management from design stage to procurement, assembly and test stages. Defence Turkey: Lastly, would you like to convey any messages for Defence Turkey readers? Our government’s determined struggle against terrorism continues and we are going through a quite critical period. In this period, as Nurol Makina, serving our security forces, from designing new vehicles to providing logistic support to the vehicles existing in the field is a kind of sacred responsibility. I would like to express that we will be supporting our courageous security and armed forces in the coming period for our country.